The month of Dhul-Hijjah is scheduled to begin on this Wednesday or Thursday, August 23 or 24, inshaa’Allah. 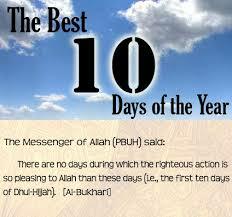 Let us learn about the great benefits of the first 10 days of this blessed month. Allah (Glorified and Exalted be He) blessed the nation of Muhammad( peace be upon him), with opportunities to reap rewards and blessings every day of the year. The last ten nights of Ramadan (the month of fasting) are among the most blessed nights of the year; in particular Laylatul-Qadr (the night of power) is extremely sacred. Similarly, the first ten days of Dhul-Hijja (the 12th Islamic calendar month) carry special status during the blessed month of “Pilgrimage.” The above Hadith of the Prophet (pbuh) spells out the importance of these ten days in the sight of Allah( Glorified and Exalted be He) and the amplified reward for all good deeds during this blessed season.